MASSENA -- J.W. Leary Junior High student Christian Harvey signed a national letter of intent last week to join the Clarkson Golden Knights hockey team. His signing made him an official member of the team, which was a life-long dream. Due to injuries sustained in a diving accident, Harvey uses a wheelchair. Prior to the accident, he was an avid hockey player, and attended Clarkson University’s hockey camp. Boston-based non-profit Team Impact arranged for Harvey to join the Clarkson hockey team, a partnership that is expected to benefit both Christian and the team. On Nov. 16, staff and students at J.W. 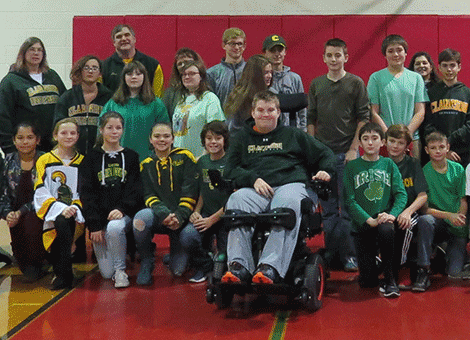 Leary Junior High acknowledged Harvey’s recent accomplishment by wearing Clarkson apparel or the green and gold colors to show support and pride for the teen. Staff and students lined the halls when he arrived at school in the morning, and ushered him in with cheers and clapping. At the end of the day, staff and students gathered in the gymnasium to take photos with Christian in order to mark the special day.